President Trump was asked about the threats during his press conference with Israeli prime minister Benjamin Netanyahu. The Anti-Defamation League has renewed its call for President Trump to explain what his administration intends to do to address the recent uptick in anti-Semitic incidents following another wave of threats against Jewish community centers across the country. On Monday, bomb threats were called in to Jewish centers in 11 cities — Albuquerque; Birmingham, Alabama; Buffalo; Chicago; Cleveland; Houston; Milwaukee; Nashville; St. Paul; Tampa, Florida; and Tulsa, Oklahoma. It appears that all of the threats were hoaxes, but several centers were evacuated as a precaution. The FBI and the Justice Department’s Civil Rights Division are investigating, according to NBC News. Similar threats were made on January 9, January 18, and January 31. Including Monday’s threats, there have been 69 incidents at 54 JCCs in 27 states and one Canadian province in 2017, according to the JCC Association of North America. Last year, only one JCC reported a similar threat. Over the weekend, dozens of headstones were also knocked over at a Jewish cemetery in University City, Missouri. Police are investigating whether the vandalism was motivated by anti-Semitism. But President Trump has not condemned the threats specifically. 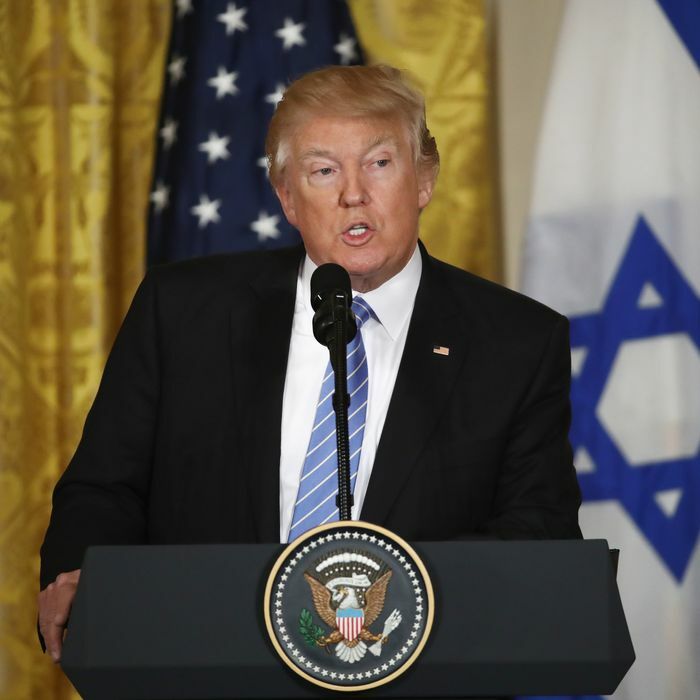 During his press conference with Israeli Prime Minister Benjamin Netanyahu on Wednesday, Trump was asked about the “sharp rise in anti-Semitic incidents across the United States” since the campaign. Trump said, “We are going to do everything within our power to stop long-simmering racism and every other thing that’s going on,” but his answer mainly focused on the size of his election win. He also noted that in addition to “so many friends,” his daughter Ivanka Trump and her husband, Jared Kushner, are Jewish. The next day, Trump lashed out at Jake Turx of the Jewish publication Ami Magazine for asking about the bomb threats, accusing him of posing a “very insulting question.” Though Turx noted that he wasn’t suggesting the president or anyone on his staff is anti-Semitic, Trump declared that he’s “the least anti-Semitic person that you’ve ever seen in your entire life,” and said nothing about the bomb threats. The ACL’s Jonathan Greenblatt said the First Daughter’s tweet was encouraging and reiterated the group’s call for her father to do more about the threats.